The book Grunch Of Giants by Buckminster Fuller. The book Operating Manual For Spaceship Earth by Buckminster Fuller. The books Synergetics I and Synergetics II by Buckminster Fuller. The book Guinea Pig B by Buckminster Fuller. The manuscript Comprehensive Thinking from World Design Science Decade 1965-1975 Phase 1 of Document 3 by Buckminster Fuller. The manuscript Everything I Know by Buckminster Fuller. 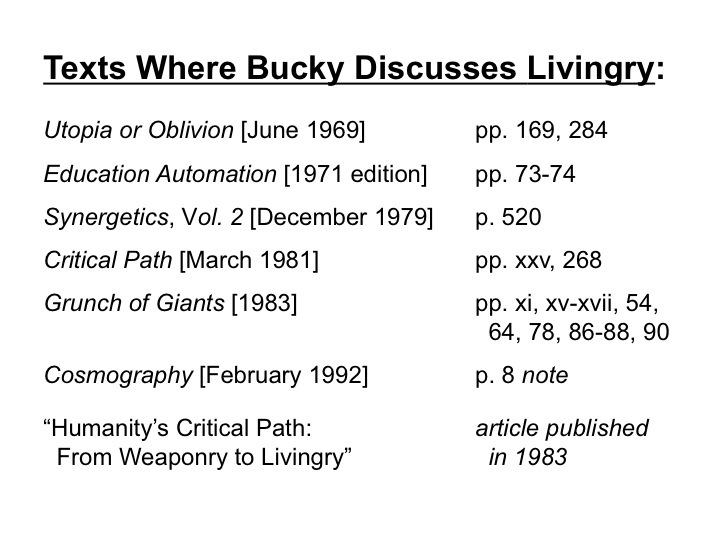 The article “Humanity’s Critical Path: From Weaponry to Livingry” by Buckminster Fuller. The article “Man’s Total Communication System” by Buckminster Fuller from the October 1970 Evergreen Review, which first appeared in Expanded Cinema by Gene Youngblood, 1970. The article “Goddesses of the Twenty-First Century” by Buckminster Fuller from the March 2, 1968 issue of the Saturday Review. The zine The Bucky Fuller Files #4, which includes in its entirety “Why Women Will Rule The World” by Buckminster Fuller, which first ran in the March 1968 “Women & The Future” issue of McCall’s. The poem “Now And When” by Buckminster Fuller from the April 1972 issue of Harper’s, which first appeared in Buckminster Fuller’s book Intuition.